When the teacher called my name, I shyly told him I had forgotten about my presentation but promised I had done the work. He didn’t let me off the hook. Stand and deliver anyway, he prompted. What came next was a 20-minute oral presentation on the 1961 Bay of Pigs Invasion, sans slides or posters or paper, no security blankets to hold onto. But it was what came a week later that changed my world: a note from the teacher telling me I had done a great job, and that he wouldn’t have known I wasn’t prepared to present that day if I hadn’t told him. He awarded me an A-, no small feat in his class, and encouraged me in my oral presentation skills, telling me I was a natural. This was a big deal for a shy BYU freshman. 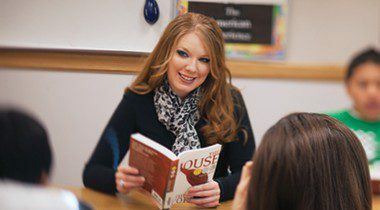 Inspired by a professor’s directive to stand and deliver, Krystal Baker now takes every opportunity to foster confidence in and share positive feedback with others. I kept that note for a very long time and let it inspire me to be confident and not let myself off the hook when opportunities arose to stand in front of people, both with job responsibilities and in gospel doctrine and Relief Society classrooms. As a high school teacher I take every opportunity I can to give positive feedback to my students and encourage them to be their best selves. I know from my experience at BYU that when someone points out an area thought of as weak, it can inspire the desire to work to make it become a strength. A short paragraph in our ward bulletin announced that the social services agency of our county was looking for couples to serve as foster parents for infants. My husband and I discussed it with each other, then prayed about it with our four children. We all agreed that we wanted to foster a baby. We took classes on attachment disorder, bonding, and other issues that foster children may experience. My BYU training in psychology and sociology helped in understanding the terms and the concepts that would otherwise have been unfamiliar. Six months later a policewoman placed a two-week-old girl in my arms. My heart melted. Ann immediately became part of the family. My husband, our children, and I all doted on her, taking turns holding her, feeding her, and giving her the love her natural parents could not. When Ann came up for adoption, there was no question but that we would make her a permanent part of our family. When she was sealed to our family in the Denver Colorado Temple, our hearts overflowed with love. My schooling again came into play when Ann began exhibiting the effects of attachment disorders. I reminded myself not to take her anger personally. We all suffered during that time, but we held fast to our faith and our love for her and each other. Today Ann is a bright and happy college student, eagerly preparing for a degree in architecture. Though I’ve never used my degree professionally, the education I received at BYU has enriched my life and that of my family and community. —Jane McBride Choate (BS ’73), Loveland, Colo.